Diet. Binge. Repeat… Are you tired of this cycle? Have you tried numerous diets in an effort to lose weight only to gain it all back and then some? Annette McLean, LCPC, CEDS, explains why the traditional answer to losing weight does not work and leaves us disillusioned and feeling like a failure. She believes that problems with weight are about much more than food. As she explains, women fail, not because they are flawed, but because food has been the tool they use to manage emotions and care for themselves. McLean weaves her personal history with her clinical expertise providing the reader a path back to wellness and recovery. Among other things, you will learn: The basic mechanics of recovery – How to aim for recovery gently and why force and perfectionism delay progress. – How to “observe” as opposed to getting “hijacked’ by your emotions. – How to investigate thoughts in a respectful way – How to develop your inner voice of wisdom. 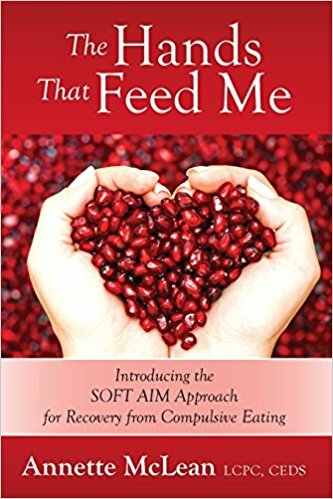 Combining a step by step feeling regulation tool (SOFT AIM) combined with the basic mechanics of recovery and providing space for self-reflection, The Hands That Feed Me is your go-to guide for recovery from compulsive eating.